If you're a fan of fantasy literature then this man needs no introduction. He's a master of his craft and his first two novels, The Name of the Wind and The Wise Man's Fear the first two instalments of The Kingkiller Chronicles deserve to have a place on every book shelf. They are simply a must read. Fans of Patrick Rothfuss are eagerly impatiently awaiting the final instalment of the trilogy, The Doors of Stone which does not currently have a release date, believe me the wait is far worse than waiting for the fifth series of Game of Thrones . 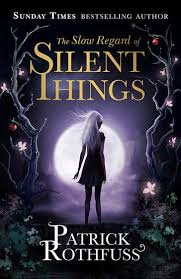 However Patrick Rothfuss has released a novella titled The Slow Regard of Silent Things which is set in the same world of The Kingkiller Chronicles and is centred around Auri a character featured in his first two books and is one of the more mysterious characters featured. I was a bit apprehensive in reading this as there have been mixed reviews even the author himself warns that the reader may not enjoy it. I think this is due to his legions of fans getting very impatient over the wait for book three, The Doors of Stone. This book is very wildly different to the first two, it has a childlike feel to it and I am instantly remineded of my love for Rothfuss's imagery, "chill and sweet as peppermint". The effect is intensified by the inclusion of some beautiful illustrastions by Nate Taylor. The Slow Regard of Silent Things reads like a fairytale, I think Rothfuss is right in that you should read his two previous books before this one as you will not be familiar with the back story or the beautiful strangeness of Auri's mysterious character. The plot is also mysterious, at first I'm not sure what it is apart from a slow regard of silent things, but Auri is utterly enchanting and strangely captivating that I find myself seeing her world through her eyes where the underthing is a massive playground waiting to be explored by an eager child. I want to know more about it and whether it will reveal anything about the doors of Stone! After reading this I discovered that Auri is an enigma and always will be, but I like that. Not everything in life needs to be explained. The book has a dreamlike feel to it. Incredibly this story has only one character - Auri, and pays no attention to the most basic plot requirements of having at least two characters, a protagonist and antagonist and creating conflict between them. There is none of that in this strangely compelling story but yet it's a great read. I feel like I've been given a glimpse into Patrick Rothfuss's mind. Furthermore it has made me even more desperate to read the final instalment of the brilliant Kingkiller Chronicles which I fear is going to be a long wait.